Promoer Ged Rathbone has completed the full purchase of Peterborough Panthers. In a major new year message, Rathbone confirmed a takeover deal with previous owners, Readypower has been finalised. And while he chose to keep the figures involved confidential, Rathbone did reveal that the financial backing of major sponsor T Balfe Construction has also enabled the purchase of track equipment which will immediately be placed under the control of the Peterborough Panthers Supporters’ Club (PPSSC). Rathbone said: “I’m delighted to be able announce the sale of the club from Readypower has gone through. “I must pass on my thanks to Rick Frost and Julie Mahoney, who have always been very professional in our dealings. “I’m grateful to them for giving me the opportunity to keep speedway going in Peterborough and both sides have since stuck firmly to the plan we put in place. “On the surface very little changes, but behind the scenes this purchase will make the club far more financially secure. “All speedway matters - on and off the track - are now under our control and thanks to the generosity of T Balfe Construction, we have been able to buy equipment which will be handed over to the PPSSC. “It is all about providing long-term security and giving a fantastic bunch of supporters a say in the future. 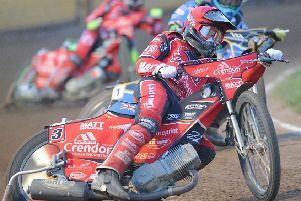 Rathbone, who stepped in following the 2014 season to ensure racing continued at the East of England Showground, insists his business model of attempting to deliver SGB Championship success while living within the club’s means will not change. He added: “Speedway clubs have to cut their cloth accordingly in these tough financial times. “I’ve always been adamant from day one that we have to be able to pay our way - and so far we have managed to do that. “We’re never going to be Glasgow with a bottomless pit of money, but I believe we can run the club prudently and successfully. “We will never spend beyond our means to chase glory only to put the future of the club in jeopardy. “We have a very solid management team in which everyone knows their role and has the future of the club at heart. “We’ve attracted very pleasing attendances during the past two seasons and I’ll be over the moon if that continues in 2017.